Many who make requests seem to have a belief that Business Intelligence is magic. They loose their ability to listen to logic and reason and simply ask you to do the impossible. Many who make requests seem to have a belief that Business Intelligence is magic. Pulling data from 18 different sources, many of which that you don’t even have access to. Childs play like pulling a rabbit from a hat. Turning bad into good and interpreting the meaning of the data. A little tougher kind of like making your stunning assistant float in midair. Creating a readmissions dashboard. Hey we aren’t Houdini. That data doesn’t even really exist. Oh sure it exists in the minds of the people who want you to produce it out of thin air, but I’ve yet to see a single Electronic Health Record that stored readmission data. They only store admission data, not RE-admission data. Those who want dashboards for Readmissions look at data like the above and talk to you like you are insane because in their minds it is clear as day that John Doe was readmitted on 1/7, 3 days after their first visit, and was then readmitted again on 1/30, 20 days after his second visit. Just then you remember the reality is more complicated than that. In reality you aren’t just comparing all inpatient visits (other than for fun) what you really care about are if the visits were for the same core diagnosis or not. You don’t want to compare the 1/30 visit to the 1/4 discharge because the diagnosis aren’t the same you only want to compare the 2/6 visit to the 1/4 discharge and you need to compare the 2/11 visit with the 2/4 discharge. If you think this is like making a 747 disappear before a crowd of people on all sides, just wait it gets worse. If you have ever been asked to produce a Readmissions Dashboard you probably understand why I’ve correlated this to magic. Every time you think you know how to grab the rabbit by the ears to accomplish the trick, the rabbit changes into an elephant. One of the really nifty tricks that Qlik can perform in data loading is a preceeding load. A preceeding load simply means you have the ability to write code to refer to fields that don’t exist yet and won’t exist until the code is actually run. The following code is abbreviated slightly so that it’s easier to follow logically but the entire set of code is attached to the post so that you can download it. 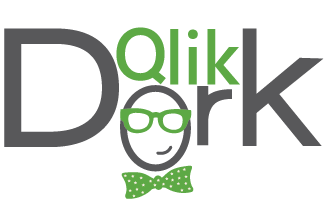 The “Load *” right below Encounters tells Qlik to load all of the other from the second load statement first, then come back and do the code below. This way we can construct the [All Diagnosis] field and refer to it within this code. You could repeat all of the logic for concatenating all of the fields for all 5-10 of the core diagnosis you want to track, or you could load the encounters and simply do a subsequent join load but you don’t have to. The Preceeding load makes your life easy and works super fast. If the MRN of the row I’m on now, is the same as the MRN of the previous row, then yes this is a readmission, otherwise no this is not a readmission it is a new patients first admission. Actually that’s the simplified version of my code. My code actually thinks through how the results would need to be visualized. Besides an easy human language Yes/No flag someone is going to want to get a count of the readmissions right? Does the Qlik Dork want to have charts or expressions that would have to use IF statements to say if the flag = Yes, of course not. I want the ability to have field that is both human readable Yes/No, but also computer readable for counting 1/0. That’s where the magic of the DUAL function comes into play. It gives me a single field that can be used for both needs. How does the entire Readmissions load work? After loading the encounters, and allowing the preceeding load to qualify the encounters into core diagnosis types I simply do a self-join to the encounter table referring only to the inpatient records and ordering the data by the MRN and the Admission date and time. If you are paying attention you’ll notice that the above is simply our “for fun” counts to show all inpatient readmissions and has nothing to do with any of the core diagnosis. In order to perform that trick I do the same basic steps but I enhance my where clause to only look for encounters that have a core diagnosis of COPD and I simply name my flags and other fields differently. And just when you think I’ve pulled as much handkerchief out of my sleeve that it can possibly I hold I do the same steps for Sepsis this time. And then for AMI. And then for CHF. And then for … Oh you know the handkerchief can go on forever and eventually we end up with a data model that includes all of these awesome fields that didn’t exist when we began so that we can actually do our work. Not only can we then provide a really nice looking dashboard which includes accurate statistics we can do it using very simple expressions that are incredibly fast. This entry was posted in Visualization and tagged Dashboard, Readmission. Bookmark the permalink. It can also be done w/ good Qlik techniques and proper data. 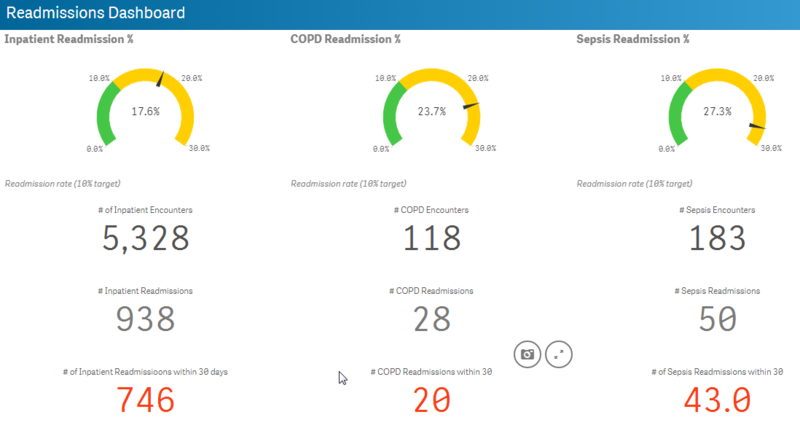 We have created readmission dashboards for a client. We have 8 million rows of IP, OP and ED data. All linked by EMPI. Not only do we have Qlik dashboards for the information, but we have advanced mapping to watch patient hops between hospitals and concentrations of frequent fliers. I’m worried now that you are spying on me or something. My next post that I’m in the middle of right now is on mapping. The ESRI mapping extension sure can add a lot of value to applications. 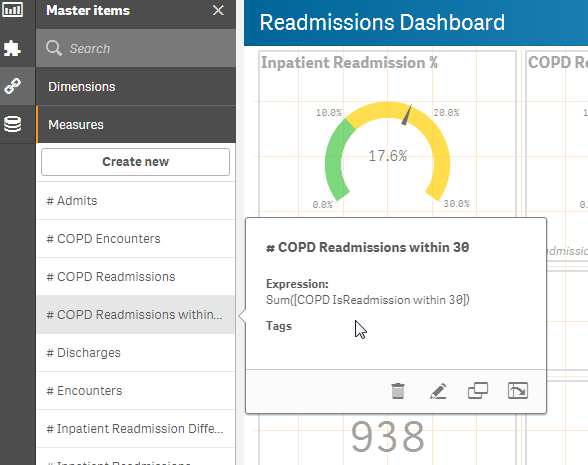 We process our ReAdmission data in the Data Warehouse and band it, which means it is available to anyone to consume (i consume it for my IC dashboards in QV) but it is available to other toolsets to use as well, not exclusively QV. Yes. Yes. And HECK YES.